Last month we took a little winter break and flew to the Bahamas. And we couldn’t leave without visiting the famous swimming pigs. We took a powerboat tour from Nassau to the Exuma islands to see them. Even though the pigs are wild, they are so used to tourists feeding them that the big ones will come swimming to the boat asking for food. It was really nice to be able to see them in person and swim with them. Part of the tour also involved visiting the nurse sharks at Compass Cay. I am super scared of sharks and even though these are bottom dwellers, they still have teeth. The tour guide just told us to be cautious and to not try to touch them close to their mouths. I was very nervous at first but I’m really happy that I didn’t chicken out. Once we were in the water, it was fine. It was a really cool experience being in the water with them. Overall we loved this day trip. We had a lot of fun and all the beaches that we saw in the Exumas were a little piece of paradise. If you want to see the famous pigs, they live at Big Major Cay (Pig Beach). Because the pigs draw a lot of tourists, there are other beaches which now also have pigs. If you want to see the (so to say) original pig beach, make sure your tour stops at Big Major Cay. The boat ride is a bit bumpy and wet. Since they have to cover quite a distance to get to the Exumas, they go really fast. They tell you to bring a light sweater or jacket, which we did. And it’s fine if you are sitting in the middle and don’t get wet. But I think it’s better to bring a raincoat (or even a poncho). if you get wet on the way back which takes more than 1 hour, it gets cold. Pieter sat next to the edge of the boat and got soaked (and cold). And definitely bring sunglasses otherwise it is very hard to open up your eyes when the boat is going so fast. It does get very crowded. So if you want to avoid being with a lot of people and to be able to take better pictures, it’s worth looking into renting a private charter and arriving early in the morning. 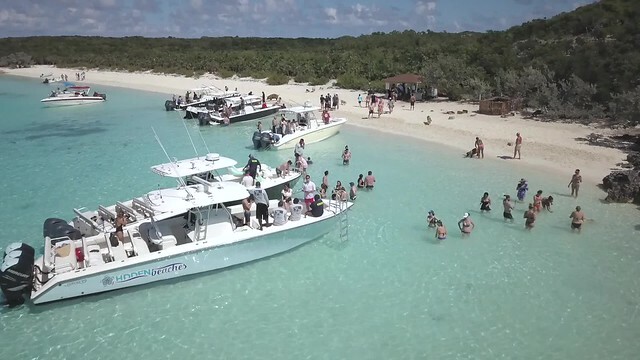 Here is a very short video of Big Major Cay, so you can get an impression of what it looks like.